Give Your SLPs the Support they Need! Looking for Individual Memberships? Click Here! With our step-by-step therapy plans, worksheets, and resources, your therapists will be able to provide highly-effective therapy. 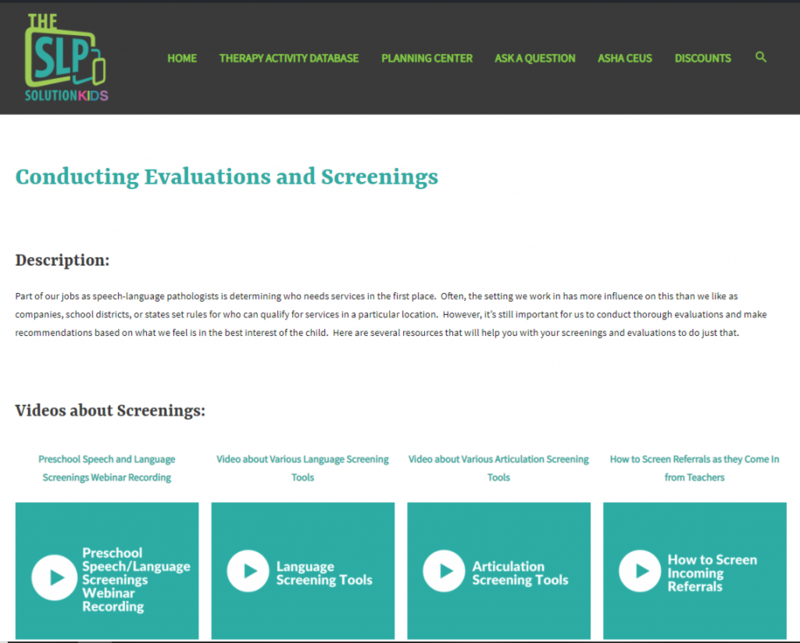 All the tools and resources your SLPs need to help you with evals, goal-writing, data collection, and more! Monthly webinars for ASHA CEUs will fulfill your SLPs continuing education requirements as well! Your SLPs will get the help and answers they need quickly with direct support from our SLP Staff and Community so they can get back to serving their clients. 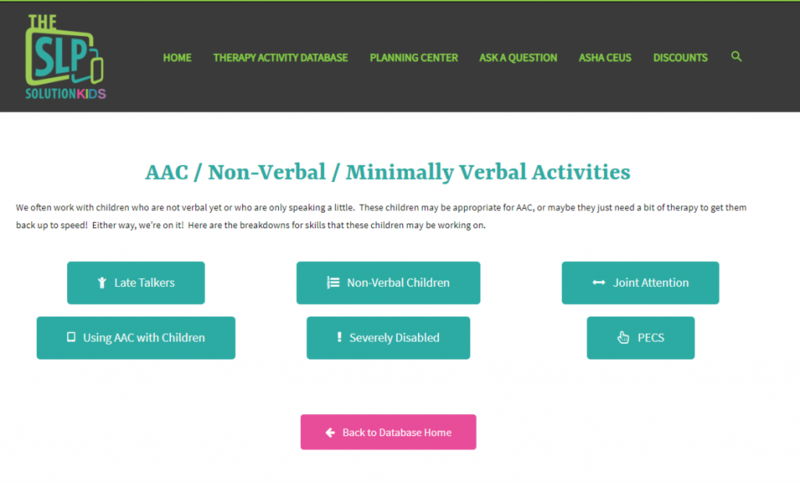 The Therapy Activity Database breaks down 100+ communication skills into step-by-step plans, complete with worksheets, therapy ideas, training videos, and additional resources. The SLP Planning Center is packed full of tools that will help you do all of the other parts of your job: evals, goal-writing, data collection, paperwork, etc. Hop on in and see how we can save you time today! You'll be learning a ton inside our platform anyway, you may as well get credit for it! 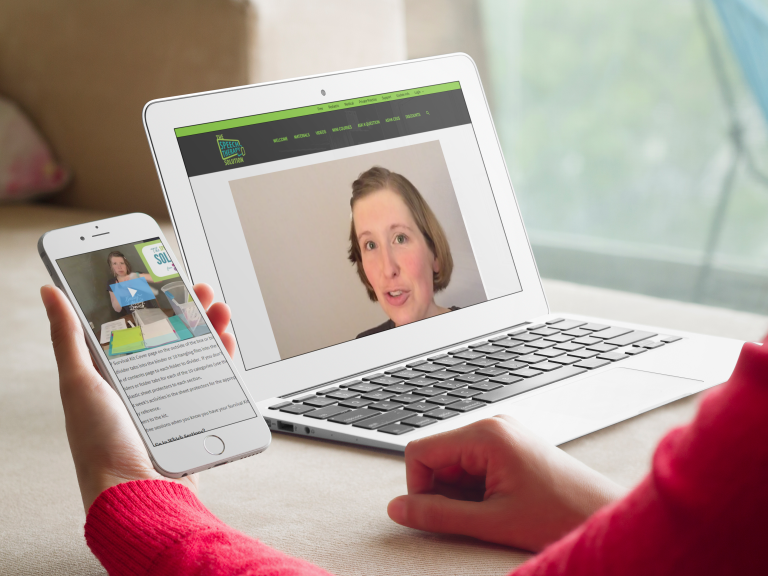 Each month we'll create a new webinar for ASHA CEUs. Watch the recordings on your time and get CEU credits! Carrie and her amazing SLP Staff are here to help! Hop into our active community and ask questions about your tough cases. We'll help you brainstorm ideas or point you toward helpful resources. We've got your back! We all have those sessions where we didn't have time to plan or our great plan went awry. Don't fret, just grab your Survival Kit! 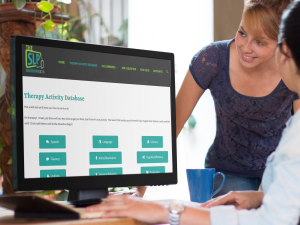 We'll help you build a resource of ready-to-go therapy activities that you can grab at a moment's notice. As if that's not enough, we're saving you even more with discounts on the Speech and Language Kids eBooks along with several of our other favorite products. We're here to support you in any way we can! Once you select a specific skill, you’ll come to a page like this one where you’ll be able to see the step-by-step task analysis of how to do therapy for that particular condition. You’ll also find therapy activities, resources, and worksheets for each step of the process. Finally, we finish each skill page off with some troubleshooting tips in case your situation isn’t quite textbook. We’ve done this process with over one hundred skills so far and we’re adding new ones each month. You’re sure to find something here to help you determine the best and most effective way to help your clients. Now let’s talk about your planning time. 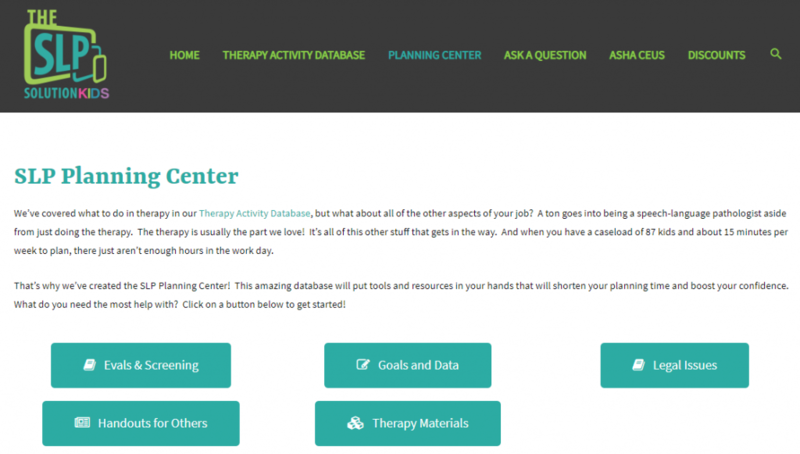 We’ve covered what to do in therapy in our Therapy Activity Database, but what about all of the other aspects of your job? 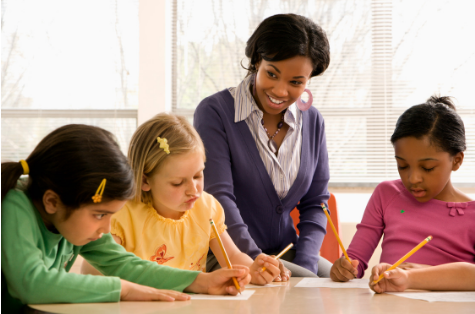 A ton goes into being a speech-language pathologist aside from just doing the therapy. The therapy is usually the part we love! It’s all of this other stuff that gets in the way. And when you have a caseload of 87 kids and about 15 minutes per week to plan, there just aren’t enough hours in the work day. 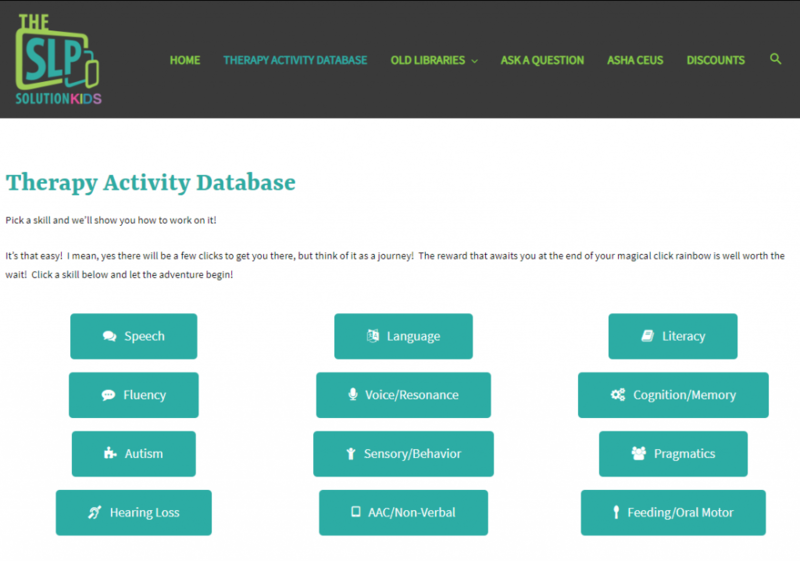 Just like with the Therapy Activity Database, we’ll be adding more tools to this section as we go along! We expect that this area will become your go-to spot when that ever-precious, though ever-small slot of planning time comes up in your schedule! Need some continuing ed? We have you covered! Each month, the members vote on one topic that they would like to have an in-depth training with the latest evidence-based practices. As a member, you will be able to watch the training live and ask questions or watch a recorded version of the training afterwards. 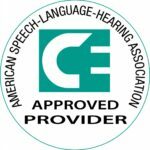 We offer webinars that are approved for ASHA CEU credit and you can earn your CEU by attending live or watching any of the recordings that are approved by ASHA within 12 months. We’re adding at least one new hour-long CEU per month and we’ll be adding additional ones as we go along. That’s everything you need to get your 30 ASHA-required CEUs per 3-year cycle! 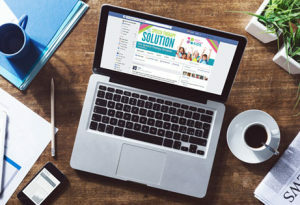 Hop into our exclusive Facebook group and ask your question in there. Carrie directly answers member questions in the group as do the other SLP staff members for Speech and Language Kids. Plus, you’ll get answers from anyone else in the group who has experience with that topic! Not on Facebook? No problem! You can also ask questions using the forum inside the membership area. Have you ever had an “Oh Crap!” session? You know, the kind that you either didn’t have time to plan for or you had a great plan and it went terribly awry. Or…Do you find that you just don’t have enough time to plan fun activities for your therapy sessions? Either way, you NEED the SLP Survival Kit in your life. 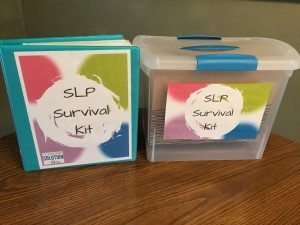 When you first subscribe to The Speech Therapy Solution membership, we’ll get you set up with your very own SLP survival kit. All you need is a binder/box, dividers, and sheet protectors. I’ll send you the rest. We’ll fill it with ready-to-go worksheets that you can pull out and do in therapy with no prep time. Use it as your backup or reduce planning time by using those materials instead of prepping new activities for each session. Then, each week I’ll send you a new set of worksheets that you can add to your kit. It will only take you a few minutes per week and you can pick the ones that are relevant to your students. Over time, we’ll build you a fully-customized set of therapy activities that will cover a variety of communication skills. The longer you stay in, the bigger your kit will be and the less time you’ll spend on planning each week! You will be set up on a payment plan via Paypal or your credit card. Each month, you will be charged the monthly fee. You can cancel at any time and there is no cancellation fee! Can You Accept Purchase Orders from my School/Work? 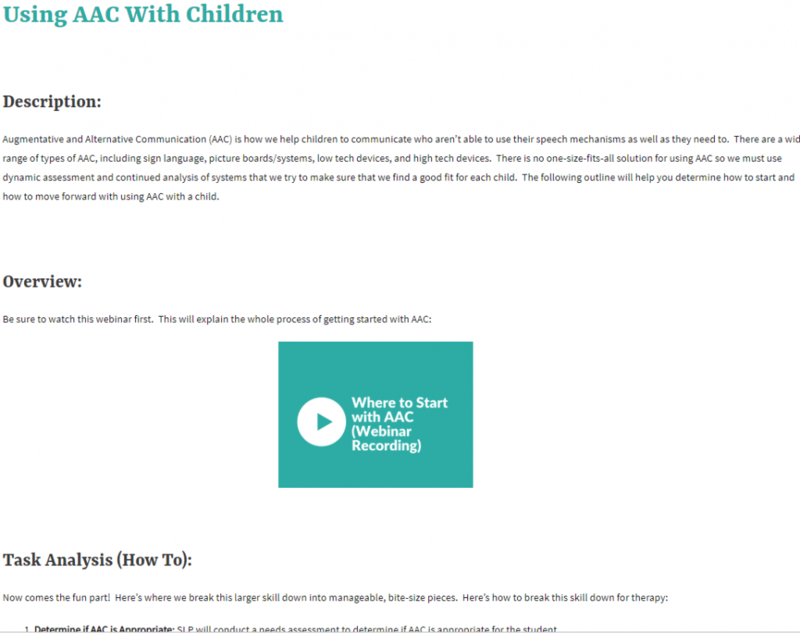 This membership is for Speech-Language Pathologists/Therapists and Speech-Language Pathology Assistants who work with children as well as other professionals who work with children with speech and language needs. 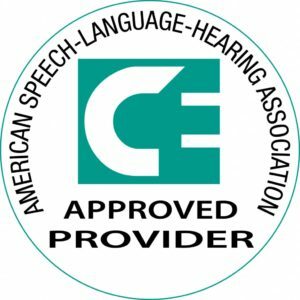 This membership is not for parents because each training video assumes a basic understanding of speech and language concepts and techniques that may be more advanced than many parents are interested in. We all got into this field because we wanted to help. 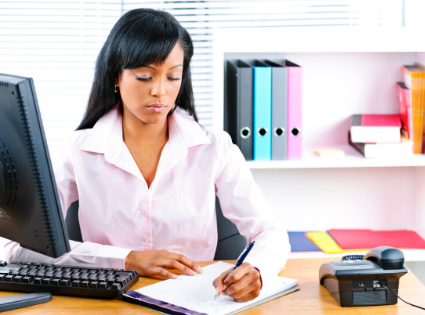 But high caseloads, tons of paperwork, and not enough planning time leads to burn-out and stress. The SLP Solution’s mission is to support you with tools, resources, and expert advice so that you can be there for the children who depend on you!